That great tradition of lumping ten or twelve bands on a single record in hopes of documenting something stylistically, geographically, artistically. Remember your first compilation? That first collection of punk artists from the 80s, that tribute album or covers comp, or that regional album that documented a scene you’d never heard of? 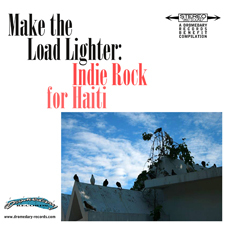 Our first comp, Make the Load Lighter: Indie Rock for Haiti was designed as a benefit record, with all proceeds donated to help the victims of the Haitian earthquake. Keep coming back; we’re sure we’ll make more.